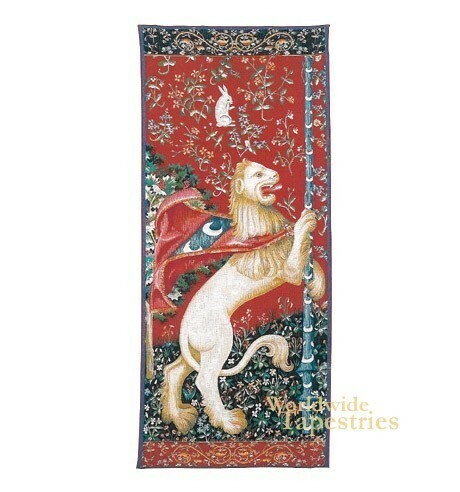 A close-up of the lion that appears in “Le Gout”, one of the six tapestries collectively known at “Dame a la Licorne” or “The Lady with the Unicorn”, “Portiere Lion” is symbolic of three natures of the lion each one symbolizing an aspect of Christ. The first is its ability to erase its tracks with its tail, which is meant to symbolize how Christ hid his divinity from those around him. Second, a lion was always thought to sleep with its eyes open. This was supposed to represent Christ’s seeming death after the crucifixion, though his spirit continued to live on. Finally, lion cubs were believed at the time to be born dead and not awoken until its mother roars it into life. This symbolized God waking his only begotten son three days later in the tomb. The six tapestries were commissioned by Jean Le Viste and it’s his family’s crest that appears on the cape the lion wears. This tapestry is lined and has a tunnel for easy hanging. Dimensions: W 29" x H 74"